The AGM-154 Joint Standoff Weapon (JSOW) is the product of a joint venture between the United States Navy and Air Force to deploy a standardized medium range precision guided weapon, especially for engagement of defended targets from outside the range of standard anti-aircraft defenses, thereby increasing aircraft survivability and minimizing friendly losses. The AGM-154 Joint Standoff Weapon or JSOW is currently in the fleet and in use by the US Navy. Foreign Military Sales (FMS) cases have been signed with Poland and Turkey for use with their F-16 fighters. Finland, Greece and Singapore are pursuing FMS cases at this time. The AGM-154 is intended to provide a low cost, highly lethal glide weapon with a standoff capability. The JSOW family of air-to-surface glide weapons are 450 kilograms (1,000 lb) class weapons that provide standoff capabilities from 28 km (15 nmi) low altitude launch and up to 110 km (60 nmi) high altitude launch. The JSOW can be used against a variety of land targets and operates from ranges outside enemy point defenses. The JSOW is a fire-and-forget weapon that employs a tightly coupled Global Positioning System (GPS)/Inertial Navigation System (INS), and is capable of day/night and adverse weather operations. The AGM-154A (JSOW A) uses GPS/INS for terminal guidance, while the AGM-154C (JSOW C) uses an infra-red seeker for terminal guidance. The JSOW is just over 410 centimetres (160 in) in length and weighs about 450 kilograms (1,000 lb). The JSOW was originally to be delivered in three variants, each of which uses a common air vehicle, or truck, while substituting various payloads. The AGM-154A (JSOW-A) entered service in 1999. The US Navy and Air Force developed the AGM-154B (JSOW B) up until Multi-Service Operational Test & Evaluation (MOT&E) but the Navy decided not to procure the weapon when the Air Force left the program. The AGM-154C (JSOW BROACH) entered service in February 2005. 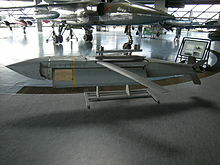 An expended sub-munition AGM-154 JSOW used during Operation Allied Force, on display at the Belgrade Aviation Museum in Serbia. During the 1990s JSOW was considered to be one of the most successful development programs in DOD history. The system was introduced to operational use a year ahead of schedule. Unlike most guided weapons and aircraft, the system never had a weight management problem, and was deployed at its target weight. The system introduced a new type of fuze, but was able to obtain authority from an independent safety review in record time. Many observers credited these accomplishments to the management style chosen by the DOD and Texas Instruments. After a competitive selection, the program staff was organized into integrated product teams with members from the government, the prime Texas Instruments and subcontractors. In one case, the prime determined that the best-in-class supplier for a design service was the government, and gave part of its funding back. JSOW was recognized in 1996 with a Laurels Award from Aviation Week & Space Technology. It is notable for a guided weapon to receive this award, which is normally reserved for much larger systems. Because of this history, JSOW has been used as a case study for development programs, and for Integrated Product Teams, and is sometimes cited in academic research on program management. The warhead of the AGM-154A consists of 145 BLU-97/B Combined Effects Bomb (CEB) submunitions. These bomblets have a shaped charge for armor defeating capability, a fragmenting case for material destruction, and a zirconium ring for incendiary effects. The warhead for the AGM-154B is the BLU-108/B from the Air Force's Sensor Fuzed Weapon (SFW) program. The JSOW B was to carry six BLU-108/B submunitions. Each submunition releases four projectiles (total of 24 per weapon) that use infrared sensors to detect targets. When a submunition detects that it is aligned with a target, it fires, creating an explosively formed penetrator capable of defeating vehicle armor. This program concluded development but the Navy decided not to procure the weapon. The AGM-154C uses an Imaging Infrared (IIR) terminal seeker with autonomous guidance. The AGM-154C carries the BROACH warhead. This two stage warhead is made up from a WDU-44 shaped augmenting warhead and a WDU-45 follow through bomb. The weapon is designed to attack hardened targets. It entered service with the US Navy in February 2005. Full rate production started on December 29, 1999. In June 2000 Raytheon was contracted to develop an enhanced electronics package for the JSOW to prevent electronic spoofing of GPS signals. This ultimately resulted in the JSOW Block II weapon, incorporating multiple cost reduction initiatives in addition to the Selective Availability Anti-Spoofing Module (SAASM) capability. JSOW Block II was scheduled to begin production in March 2007. The JSOW contains a modular control and deployment interface that allows future enhancement and additional configurations since it is likely that additional variants will emerge. The basic airframe is advertised as a "truck" and the JSOW-as-a-truck capability is widely advertised. Raytheon has placed a tremendous investment in the JSOW program and will certainly try to extend the Department of Defense contracts for as long as possible with system upgrades and repackagings for new missions and targets. Raytheon was as of 2005 under contract to develop the JSOW Block III, which adds a Link-16 weapon data link and moving maritime target capability to the AGM-154C. It was scheduled to be produced in 2009. The first three launches were conducted in August 2011 from an F/A-18F. The JSOW-C1 completed integrated test and evaluations in January 2015, moving on to operational tests. The C1 version is slated for delivery in 2016. It achieved Initial Operating Capability on 22 June 2016. On 11 October 2017 the Department of the Navy declared the Joint Standoff Weapon (JSOW) C-1 ready for full operational capability. In addition, the AGM-154A-1 configuration is under development by Raytheon for FMS sales. This version replaces the submunition payload of the AGM-154A with a BLU-111 warhead to enhance blast-fragmentation effects without the unexploded ordnance (UXO) concerns with the BLU-97/B payload. A Pratt & Whitney TJ-150 turbojet engine for a powered JSOW is being tested. The powered variant name is JSOW-ER, where "ER" is for "extended range". JSOW-ER will increase range from 130 to 560 kilometres (70 to 300 nmi). The AGM-154A was the first variant to be used in combat. The AGM-154A traditionally is used for SEAD missions. Initial deployment testing occurred aboard USS Nimitz and later aboard the USS Dwight D. Eisenhower. The first combat deployment of the JSOW occurred over southern Iraq on December 17, 1998, when launched by a single F/A-18C from the "Checkerboards" of VMFA-312, Carrier Air Wing Three embarked aboard USS Enterprise during Operation Desert Fox. The glide range of the JSOW allowed the weapon to strike a target located in the southern suburbs of Baghdad. This weapon has enjoyed success since its early use. One adverse event occurred in February 2001, when a strike of F/A-18s from the USS Harry S. Truman battle group launched a massive attack on Iraqi air-defense sites, nearly every weapon missed the target. The cause of the miss was reported as a software problem. This problem was solved soon afterward. 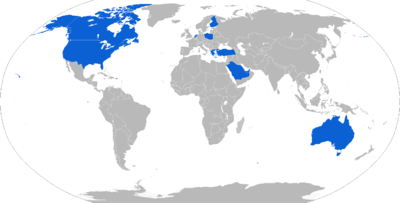 Since 1998, at least 400 of the JSOW weapons have been used in the following conflicts: Operation Desert Fox, Operation Southern Watch, NATO Operation Allied Force, Operation Enduring Freedom, and Operation Iraqi Freedom. USAF terminated production of JSOW in FY 2005, leaving the USN and USMC as the only U.S. services obtaining new JSOWs. According to a test report conducted by the United States Navy's Weapon System Explosives Safety Review Board (WSESRB) established in the wake of the tragic 1967 USS Forrestal fire, the cooking off time for a JSOW is approximately 2 minutes 11 seconds. Primary Function: Air-to-surface Standoff from Point Defense (SOPD) weapon, for use against a variety of targets. AUPP AGM-154A, $282,000. Total program cost: $3,327,000. AGM-154B, $484,167. Total program cost: $2,033,500. AGM-154C, $719,012. Total program cost: $5,608,000. ^ "Raytheon Makes First International Joint Standoff Weapon Sale to Turkey - Raytheon press release". prnewswire.com. Retrieved 2 April 2018. ^ "Raytheon: JSOW Weapon System". www.raytheon.com. Retrieved 2 April 2018. ^ "AGM-154 JSOW Wins US DoD Acquisition Award". Defenseindustrydaily.com. 2006-02-27. Retrieved 2017-02-17. ^ "Raytheon Delivers 2,000th Joint Standoff Weapon". ^ 11:33, 10 Авг 2011. "Авиация ВМС США выполнила три первых испытательных пуска ракет JSOW С-1". Flot.com. Retrieved 2017-02-17. ^ "Army develops mini missile system components". Spacedaily.com. Retrieved 2017-02-17. ^ "Raytheon Delivers First Joint Standoff Weapon C To Australia". www.spacewar.com. Retrieved 2 April 2018. ^ Pittaway, Nigel (March 2009). "F-111 makes way for Super Hornet". Defence Today. p. 12. Archived from the original on 1 February 2014. Retrieved 30 May 2012. ^ "Air Weapons: JSOW Cripples JASSM". strategypage.com. Retrieved 22 January 2015. ^ "Ilmavoimat testaa MLU2 -päivityksiä (Finnish Air Force Testing Improvements of Mid Life Upgrade 2)". ^ "First JSOW-C and JDAM delivered to the HAF". ^ a b "Washington Beef up the Gulf States with 10,000 Strike Weapons Worth US$10 Billion". Defense Update. 17 October 2013. Retrieved 21 October 2013. ^ "Defense Industry Daily". defenseindustrydaily.com. Retrieved 2 April 2018. ^ Petty, Dan. "The US Navy -- Fact File: AGM-154 Joint Standoff Weapon (JSOW)". www.navy.mil. Retrieved 2 April 2018. Wikimedia Commons has media related to AGM-154 Joint Standoff Weapon.